V.F. Corporation (VFC) designs and manufactures, or sources from independent contractors various apparel and footwear products primarily in the United States and Europe. This dividend champion has paid uninterrupted dividends on its common stock since 1941 and increased payments to common shareholders every year for 39 consecutive years. The most recent dividend increase was in October 2011, when the Board of Directors approved a 14.30% increase in the quarterly dividend to 72 cents/share. V.F. Corporation’s largest competitors include Coach (COH), Ralpha Lauren (RL) and PVH Corp (PVH). Over the past decade this dividend growth stock has delivered an annualized total return of 18.50% to its shareholders. The company has managed to deliver a 17.70% annual increase in EPS since 2001. Analysts expect V.F. 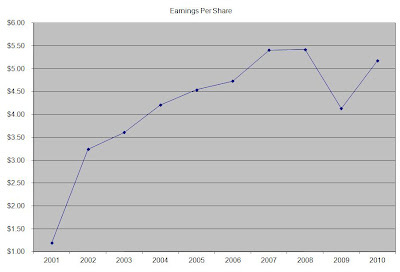 Corporation to earn $8.04 per share in 2011 and $9.31 per share in 2012. In comparison V.F. Corporation earned $5.18 /share in 2010. I last analyzed the stock in 2010, but never managed to pull the trigger, given the fact that I know little about apparel. I have been skeptical of most apparel and footwear industries, but V.F. Corp has managed to defy my skepticism. The company seems to have strong brands and pricing power, which could explain the reason why it has been able to earn sufficient amounts of excess cash to pay higher distributions for almost 4 decades. In early 2011 the company updated its long-term targets to reflect confidence in its future. In short V.F. Corporation aims to add $5 billion in organic revenue growth and $5 in earnings per share over the next five years from 2010 levels. Strong growth in its highly profitable international and direct-to-consumer businesses is expected to fuel an expansion in operating margins to 15%. Over the next five years, the company’s goal is to grow international revenues by 15% annually to comprise 40% of total revenues. V.F. Corporation’s management team also expects 15% growth in its direct-to-consumer businesses, which should account for about 22% of revenues by 2015. The company’s acquisition of Timberland Brand, will help it acquire a strong lifestyle brand, and would result in higher sales as well as $35 million in annual synergies. This acquisition is expected to add at least 50 cents/share in 2011, at least $1/share by 2012 and $2/share by 2015. 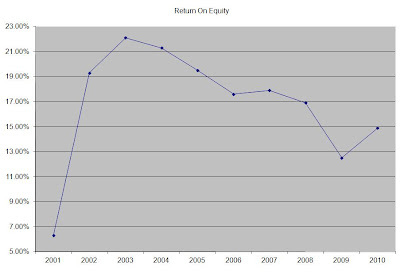 The company’s Return on Equty has been on a slow decline since hitting a high at 23% in 2003. This indicator seems to have hit a bottom in 2009, and is currently on the rebound. Rather than focus on absolute values for this indicator, I generally want to see at least a stable return on equity over time. The annual dividend payment has increased by 11.20% per year since 2001, which is lower than the growth in EPS. I would expect V.F. Corporation to keep increasing in dividends at 10% per year at least for the foreseeable future. An 11% growth in distributions translates into the dividend payment doubling every six and a half years. If we look at historical data, going as far back as 1986 we see that V.F. 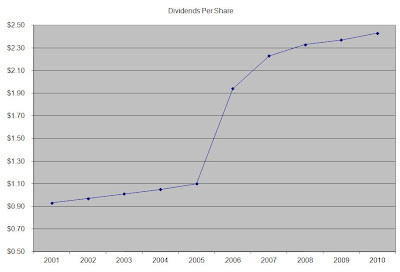 Corporation has actually managed to double its dividend every 8 years on average. 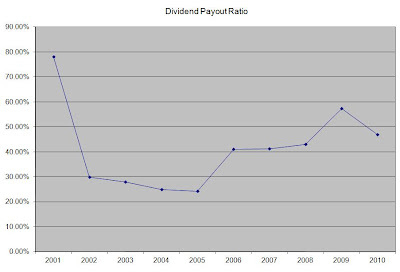 The dividend payout ratio has remained sustainable for the majority of the past decade. A lower payout is always a plus, since it leaves room for consistent dividend growth minimizing the impact of short-term fluctuations in earnings. Currently V.F. Corporation overvalued and is trading at 22 times earnings, yields 2.10% but has a sustainable dividend payout. I am excited about the growth opportunities behind this stock, and the potential for dividend growth and capital gains. I would keep V.F. Corporation on my radar, and would consider it for inclusion in my dividend growth portfolio on dips below $115/share.